Yes, the half at 15.5 miles and not the full for another 10. Maybe I’m just getting old. Or smarter. 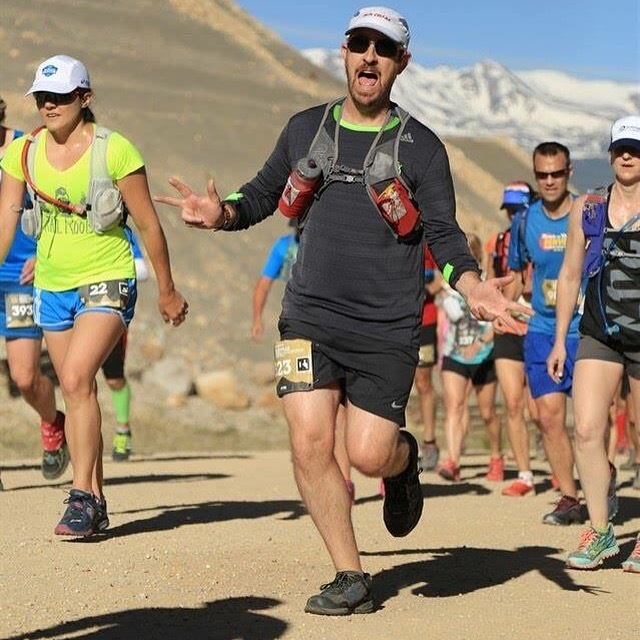 Well, I returned from a 10 day trip to Ohio on Tuesday and then decided to register for a race in Leadville that was a few days later. Maybe not smarter. 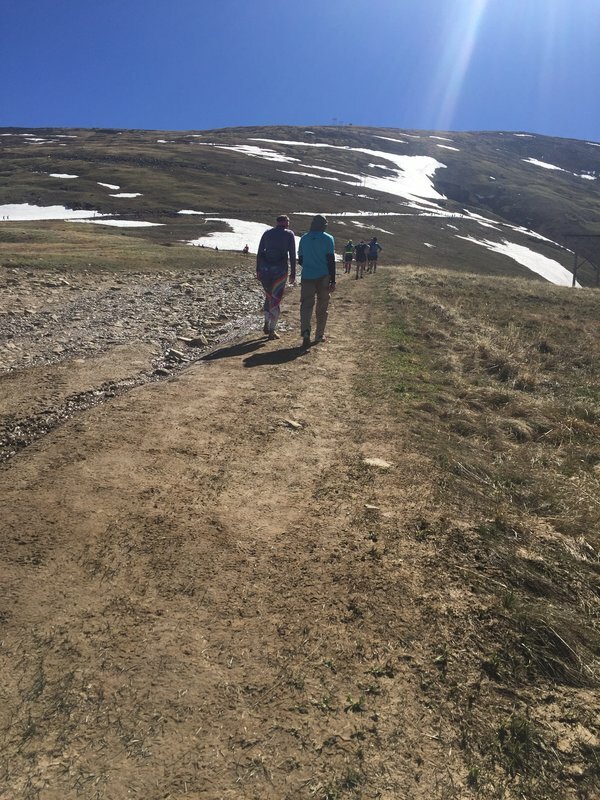 My goal for the race was to get to the bottom of Mosquito Pass not completely wiped out. If I did that full course, I would have had to go up and around Ball Mountain first. Remembering the two times that I have done that course, it didn’t sound like a good idea. Those two times I at least did some training for it. This time, eh. Maybe 18 flat miles a week? As normal for this race, I left my house about 5am for the 2 hour drive up the mountain. I parked in the usual parking lot right behind the race store. I went in and picked up my bib and goody bag. Maybe it took 3 minutes. I went back to my car to drop stuff in there and ran into Mitch. Decided to go with him for his packet pickup, then headed across the street to a coffee shop that recently opened for business. We ran into several other people, so we hung out and told stories. Some had plans for the day while folks like me just came for the views. I was curious to see where my fitness level was. The previous month I did rack up a marathon, half marathon, and 10k finish. They weren’t my fastest by an means, but at the same time I’m not ready to say “just finishing” is a win at those distances. With about 20 minutes until start, we decided it was a good time to get ready. I headed back to the car and pinned on bib, sunscreen, and put on my UD vest. 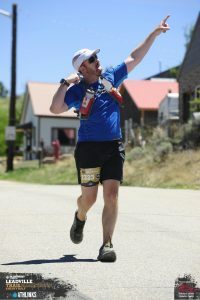 I decided that I would run with only 1 water bottle as the aid stations were a few miles apart. Plus, if anything went really wrong, it’s 3-4 hours, right? That seems to be where I get myself into trouble. At the starting line I took a few photos, made sure GPS watch was working, and said a prayer. The first 2 miles of the course is uphill. Starting at 10,000 feet in elevation isn’t enough, so the race wants to make sure we really know it. At about 1.5 miles, the course splits with the marathoners going right and us halfers going left. I remember vividly what was ahead for the marathon. Probably for the first time since I can remember, I was glad to not be on the longer course. About another mile and those runners would be doing a slow, steady, march up while inhaling the dirt of those in front of them. Want to know what I mean by “uphill”? Get on a treadmill and set the incline to 40%. Oh wait, even treadmill makers know that kind of incline is crazy. Onto the left for us 15.5 milers! It was a decent climb for the next mile. 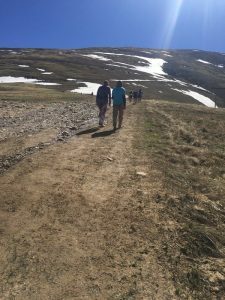 I spent the time chatting with a guy from Boston, a lady that had moved to Denver a few months ago from Minnesota, and another that was huffing and puffing. I was still smiling and noticing I didn’t know anyone. Up here, there is a bit of a jump in the running world from the half to full marathon. 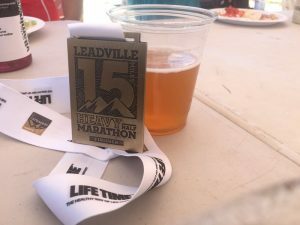 I have been running in Leadville for over 5 years now, so I generally knew at least a few people at each race. It was getting warm out, so I decided to peel off my long sleeve tech shirt. I didn’t really think about adding sunscreen to newly exposed skin. Temperature was climbing to the 70s. That’s going to hurt tomorrow. 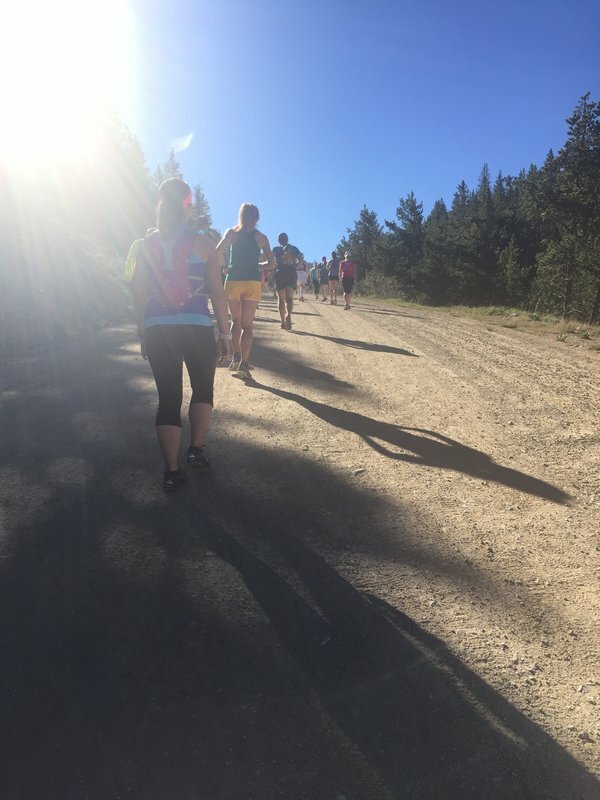 I hit the first aid station and grabbed a few chips, topped off water bottle, and started to jog down the hill. I’ve noticed lately that my body isn’t as loose as it used to be. There was a time when I would run down the trail yelling “I’m a ninja runner!” and bounce side to side like the first obstacle in American Ninja Warrior. Just a couple miles later and at the base of Mosquito Pass ready to climb. The fun part of this race is the course takes you down to about 9,600 feet of elevation and then spend the next 3 miles climbing to 13,100 feet. The terrain is loose rock and towards the top you could have a snowball fight. I made sure to stop more than a few times once hitting 12k feet so my heart didn’t feel like it would completely pound out of my chest. Afterall, the views from up here are pretty amazing. I climbed a little faster than in past years. That was to be expected as previously was on the marathon course which meant I had an additional 5 miles and 2,000 feet of climbing by that point. There were others on the climb not doing as well. Many bent in half throwing up … or trying to. Altitude is a weird thing. On one trip up here all can be great. Do the same steps a month later and you can end up laying across a rock begging for a helicopter ride. 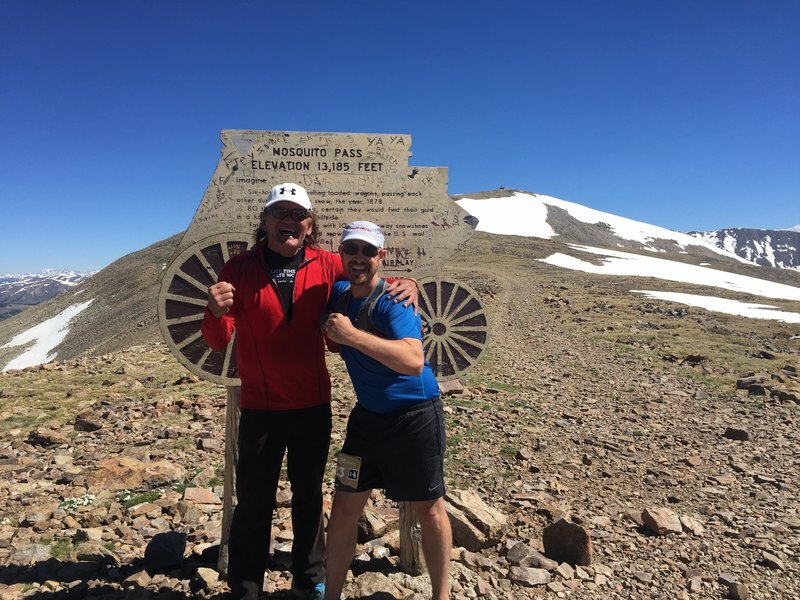 Once I hit the top, I went over and got a photo with Ken Chlouber, founder of the Leadville 100 race series. Always a great motivator and has a way to push a little farther. I went over to what looked like the aid station. There was a box of bottled water, so I opened one up and dumped it into my water bottle. Took a few more photos and headed back to down the trail. The lead marathon runners had already caught up so traffic coming up was building. Now I could keep an eye out for friends coming up as I descended. Oh yeah, descending down this rolling rock trail with 2-way traffic. If I were to lean to the right, pretty good chance I’d get down the mountain faster. I just may not be alive to tell anyone about it. He’ll be running down the mountain when he runs. Got a few smiles out of it. Running is a whole lot easier when you’re smiling. If anything, it makes people wonder what you are thinking. I took a drink from my bottle. Disgusting! No idea what was in that water I took, but I wasn’t drinking anymore of it. Not sure if I wasn’t supposed to use that water, but it was not right. At the aid station haflway down the mountain, I dumped the bottle and refilled. Then it was back to gravity. It wasn’t long before I saw friends from the marathon course. I grabbed a pic with Othman and quick exchange with Nick. Then I tried out the water in my bottle. Gross! It tasted like water from the garden hose. As I hadn’t been really drinking much water on the descent, I sipped as much as I could from the bottle knowing I need water. My hope was that it really was water from someone’s backyard and no other water content issue. 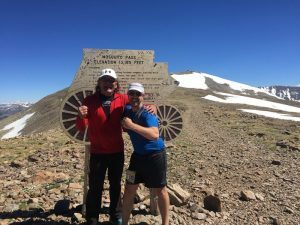 In my rush to get to the bottom to the next aid station, I almost missed Mitch. 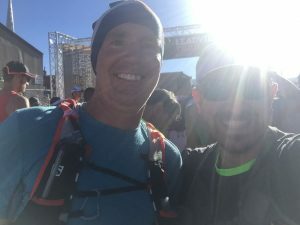 He grunted “hey Alex” as my head whipped back around and I yelled “hey Mitch!” It looked like the heat was effecting his day and he was just starting the climb. Again, glad to be doing the shorter distance today. At the aid station I dumped my bottle again. This time I went for half Roctane and half water. I don’t have the best experience with Roctane so wanted to water it down a bit in case sweet/sugar issues arise. After filling, grabbing some fruit, and chips, I was off on the easy descent then 1 mile climb to the last aid station. Stupid Stomach. No idea what or why, but had that uneasy feeling. That one where you feel like you’re going to puke, going to the bathroom, and take a nap all at the same time. Wow, that’s quite a wave of bad stuff all at once! My stomach really didn’t want me to run. Not sure if it was the water catching up with me or maybe the fruit. I may have issues with eating fruit at high altitude. Maybe the sugar or acid content? Hard to say. Into the last aid station means just a 3 mile downhill trot. I ran into Terry who was running the marathon. We chatted for a bit and started out of the aid station together. It wasn’t long before my stomach put the brakes on even running downhill. Come on! It’s downhill! Just lean forward and control fall for cryin’ out loud! Frustration and patience. Something I have been dealing with no so well over the past year. Not sure if this is a sign of cranky old man syndrome or what. I’m kind of getting tired of it. Stupid patience. About a mile from the finish, I pulled over to a rock and took a bathroom stop. Urine color a bit dark and some pain in lower abdomen. Medical checklist starts firing away in my brain. Clearly could use more water, but maybe I also had a bug or something? Hard to say as the medical guessing of doctors is amplified when you toss high altitude into the equation. Finally, stumbled onto the pavement and started chatting with a runner from Texas. He said they don’t have these kind of hills in Texas. Lots of incline on the treadmill! As we approached the finish line, he pointed to the left and said his family was there waiting to cheer him on. I told him I would slow down so it looked like he was surging ahead. He smiled, thanked me, and I took it down a level. Was a very cool moment to see his family yelling and smiling and gushing with pride! I may have done a couple fun poses on the way into the finish line. What the hell … nobody’s paying attention anyway. After getting the medal, another coffee cup, and a beer, I sat down. I made small talk with a few other runners that I have crossed paths with online, but didn’t really feel like eating. The beer tasted great, but my stomach said to stop. Seemed like best next step was to head to the car and make my way back home. 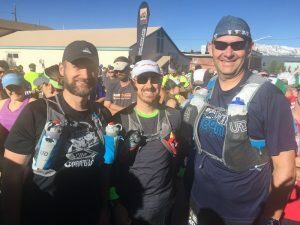 Another race distance done in Leadville. There’s only one left that I haven’t completed … 100. Not sure when that will happen as it requires more training commitment than my life has to offer at the moment. I didn’t really train for this race, so tackling the 100 would require support from family for it to have a chance. There’s always a little toothpaste left in the tube.